Memorization. A lot of people think that's what reading tarot is about. A lot of readers will say, "I read cards a little, but not really—I still have to use the book." Or, "I can't remember what they all mean!" Guess what? You don't have to! You can learn to read cards specifically, concretely, vividly—and you don't need to cross your eyes over one more list of terms like "balance," "harmony," "manifestation," "affirmation," or whatever. You become a powerful reader not by memorizing what someone else thinks a card is about, but by understanding, deep in your gut, what you think a card is about. Sometimes we tend to think tarot is only useful for describing the dramas of our lives. Break up with somebody? The Tower! You're pregnant? The Empress! Stabbed in the back? 10 of Swords! But life's not always like that, and neither is tarot. What happened yesterday? Did you take your dog for a walk? Did you clean the bathroom? What are the cards for those? Don't know? Why not? You are already the expert on every moment of your own life. Find those moments in the cards, and you'll be able to find anyone else's life moments in there, too. All our lives are ordinary, and all our lives are special, too. Like the twelve houses of astrology, a tarot deck is a way of organizing the cosmos, i.e., everything you know. In the case of tarot, it's as if each card is one of 78 file drawers. A lot of people will tell you what should go with each card, but it's a lot easier if you decide for yourself. It's like being in someone else's kitchen. In your own kitchen, you know where the can opener lives. It's in the top drawer under the counter between the sink and the stove. Why wouldn't it be? It just makes sense. Try to find the can opener in someone else's kitchen, though. By the time you find it, I bet you've burnt the onions! I believe that practical application is easier than people think. If everything in life is in the cards, then it's just a matter of discovering which card a given person/thing/event relates to. And it's entirely up to you. If your kids are singing "99 Bottles of Beer On the Wall" in the car on the way to summer vacation, and you want to call that the 7 of Cups, you can do that. Try a few of these for size. The cop down the street? I'm meeting an old friend to chat? A plumber's coming to fix a leaky pipe? If you can do all this, then you're speaking fluent tarot. And you never have to stop. You can ask yourself at any point: when you're tying your shoes, when you're checking a book out of the library, when you're brushing your teeth: What would this be in tarot? Even the most ordinary story can be expressed in tarot: "I went to do some errands in my car. At the store, I tripped over a shopping cart and fell. An attractive stranger asked if I was okay, and I was so distracted I forgot to get the milk." One person might read that as: The Chariot (car), 6 of Pentacles (transactions), The Tower (accidents), Knight of Cups (cute guy), 7 of Cups (distracted! ), and Ace of Cups reversed (the forgotten milk). Another might read it as: Knight of Wands (on a mission), 10 of Wands (trying to do too much), The Fool (falling! ), 6 of Cups (caring good Samaritan), and 7 of Swords (flustered). What if you get stuck? You're standing in line with one child pulling on your hand and another grabbing chocolate off the display while you're trying to talk to the cashier and you think (you somehow still have some brains left over for thinking, because you are a superstar), "There isn't any tarot card that looks like my life right now!" Weellll, not so fast. When the picture, or your intuition, or a keyword isn't enough to help you find a match for the thing you're thinking about, you can use correspondences to expand your webs of meaning. After all, tarot is usually just not that literal. If it were, we'd all be strolling around dressed in Renaissance Faire garb. Anyway, what are correspondences? They're just connections others have made between two different sets of ideas. The simplest correspondences are probably the elemental ones: you know, Cups = Water, Pentacles = Earth, Wands = Fire, and Swords = Air (though sometimes those last two are switched). You can use correspondences as a road map to free-associate, until there's a match between the real life situation you're thinking of and some of those correspondence qualities. Is there something hot or cold about it? Dry or wet? Is it crowded or empty? I got the 10 of Cups—cold, wet, crowded—today, and it happened that I went swimming in a pool full of people. Or suppose you wanted a card to represent the Internet. For me, that's the Star, because it corresponds with Aquarius, the fixed form of air—which is how I think of a stable but invisible network of connections. So, too, does a star provide guidance for us from a distant sky. Going deeper into the correspondences provides more and more ways of making connections. Blowing out the candles on a birthday cake? That's the 9 of Cups—not just because it's the "card of wishes," but because it's associated with the number 9, which corresponds to the sphere Yesod on the Tree of Life, which is where the astral plane just beyond our reality begins. Wishes we make there transform reality. Hiring a contractor? 3 of Pentacles, not only because its title is the "Lord of Work" and you can see people building stuff on it, but because it's associated with the sphere Binah, on the pillar of Form, and the planet Saturn, which gives matter form. Getting a cold? 8 of Swords, because you're immobilized. Also because it corresponds to Jupiter and Gemini, and your fate (Jupiter = Wheel of Fortune) is interfering with your free will (Gemini = Lovers), and because Air (elemental association), your breathing, is affected. The correspondences provide a structure on which you can hang a memory palace's worth of associations for each card, which is why I love them. You could make up your own correspondences, I suppose. For example, if you were a bartender you could associate bourbon with the Emperor and wine spritzers with the Page of Swords, or something. But the beauty of the Western magical tradition is that many of the basic correspondences already exist thanks to centuries of occultists linking up astrology, Kabbalah, I Ching, whatever they could find. And there's already a framework for matching them up to the tarot, thanks to the magical society of the Golden Dawn. 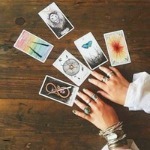 Where can you find a comprehensive table of those tarot correspondences? Funny you should ask. My book, Tarot Correspondences: Ancient Secrets for Everyday Readers, is full of correspondence tables sorted every which way from Sunday, as well as guidance on how to use them. Anyway, back to you standing at the cash register with the kids crawling all over you. I'd call that a 5 of Wands situation. The 5 of Wands corresponds to Saturn, the planet of pressure, and 5, the number of Strife, and no doubt your blood pressure is rising (wands = Fire). You're literally in a pressure cooker. Poor you! But don't you feel better now that you know? What's the point of learning to speak fluent tarot? The point is that tarot speaks back. At some point your understanding of how your life looks in tarot language, and the tarot's understanding of what's going on in your life, are going to converge. When two understandings meet, that's a conversation. You'll be cleaning up leaves from the yard, slinging the rake over your back, and you'll remember you got the 10 of Wands that morning. You'll look at the 8 pancakes in the skillet and recognize the 8 of Pentacles you drew just before. Your life brims with personally meaningful coincidences—what Jung called synchronicities. And in this conversation you can argue with tarot. You can say, "No, 10 of Swords, I'm not going to lie down in bed feeling sorry for myself today. I'm going to sharpen 10 pencils. I'm going to write a 10-word haiku. I'm going to make myself 10 kabobs and grill them, and I'm gonna lick my 10 fingers after." At that point, you're not doing divination any more. You're doing magic. And you can do it for the rest of your life. If you'd like to learn to apply tarot to your everyday life, or simply strengthen your skills as a reader, check out Susie's brand new online tarot course, The Living Tarot. Article originally published in The Llewellyn Journal. Copyright Llewellyn Worldwide, 2018. All rights reserved.